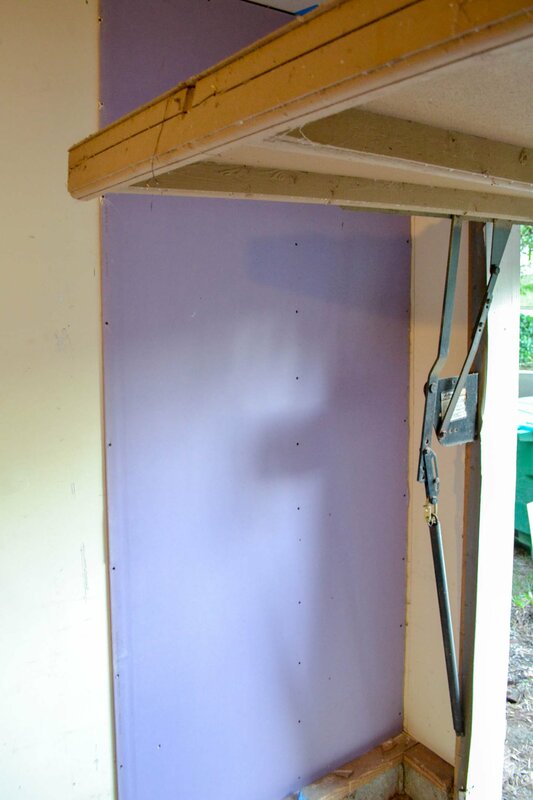 Thanks to a new product, I’m going to be able to add sound dampening to my new garage workshop plan without ripping out the old drywall, saving me time and effort. 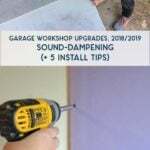 In this post, learn why I’m installing sound-dampening to the garage (and its benefits), plus tips on how to retrofit thin drywall board over existing drywall. Those of you who have followed me for a long time know about my weird relationship with my one-car garage. 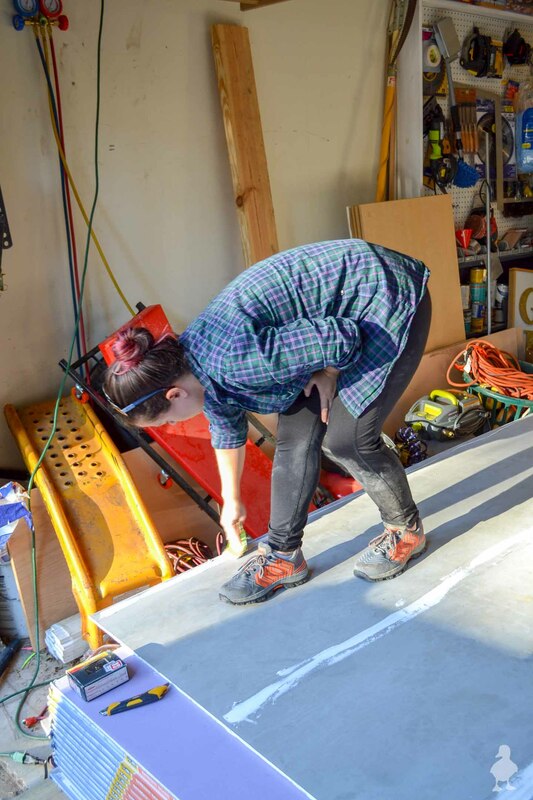 As much as I DIY, with as many tools as I have… it just hasn’t ever worked well for me. It’s disorganized: I’ve built a pegboard wall, added a “temporary” lumber rack, etc. But despite all of that, I haven’t really had a proper plan. 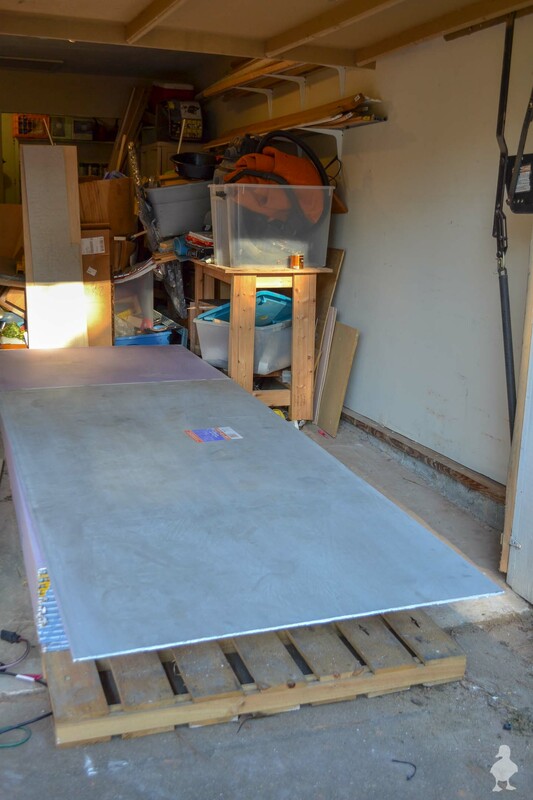 I’ve created stopgaps until the next thing throws the garage into chaos again. I often just build things in the living room or in the kitchen for the extra floor space. My job creates a huge need for lots of supplies, and I have very few spaces to store it and the space to work without it overflowing into the house. It’s hot: Georgia summer days equals sweat. Respirators often have sucky air ventilation, protective eyewear gets steamed up, and mosquitoes have always made it uncomfortable. It’s loud: I live in a noisy suburban neighborhood where the houses are close to each other. I also work from home (where traditional work hours are nonexistent). It also means I am surrounded by constant interruptions. I get my most creative and inspired during quiet hours — which also just so happens to be when my neighbors wouldn’t appreciate hearing loud tools down the street. Adding video to my DIY instructions these days has been really beneficial for me as a brand, but it means that I need to be able to record without someone else’s lawn mower, seven houses down, finding its way into the microphone. That can lead to a lot of re-shoots when I’m already pressed for time and trying to juggle business demands. For this reason alone, I feel like there’s a real opportunity to do a meaningful part of my job better. My neighbors have never complained about me doing anything late at night (mostly because I have always stopped early), but I would love to feel a little more freedom in this regard. To complicate matters further this year, K moved in. He has his own tools. For a space that’s already always too full. See where I’m going with this? It’s long past due that we make some changes in what should be one of my most efficient space of this house. It’s going to be a long journey, but I need a proper workshop! As strange and even crazy (at first) as it may seem, I needed something to inspire me. I was already building my pub shed for extra storage and knew that a real garage workshop may be possible once I moved my outdoor supplies. 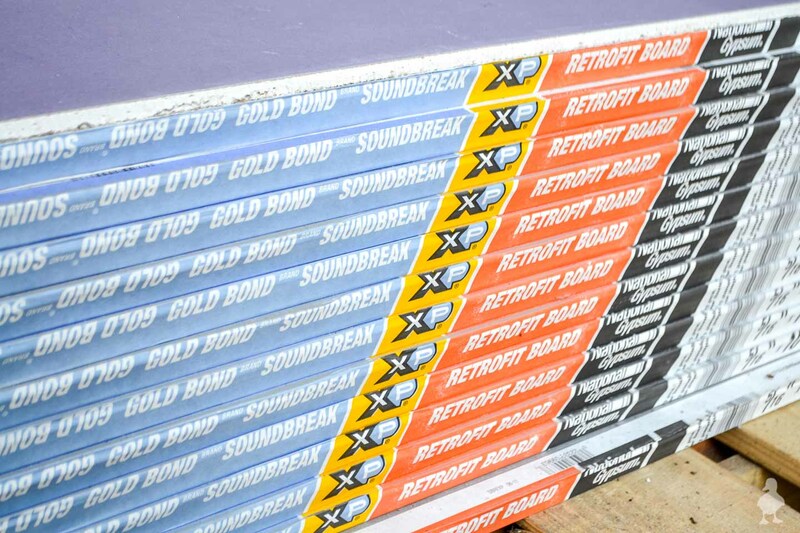 When I went to National Gypsum headquarters earlier this year and learned about the innovations they’ve been making with drywall, I got an idea: what if I used their Soundbreak XP™ Retrofit™ board to cover over my garage drywall and office? It wouldn’t fix everything, but it could be cool to try. And it might help my sound-related conflicts. 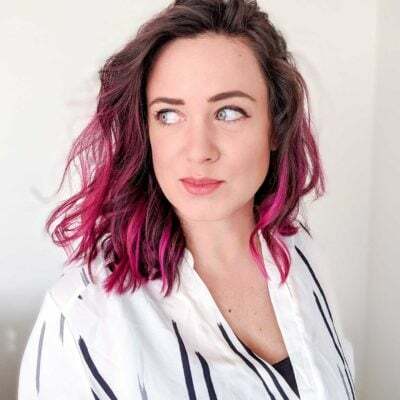 I know myself well enough to know when something can be a game-changer for how I work, and this could very well be the push I needed to solve the other issues. condos/townhomes with “thin walls”, etc. In my case, I think it’s going to be a cool experiment. With just a little bit of labor, it could make a significant difference in the quality of my videos, allow me to better tune out the world when I’m working, and more. I don’t really see much downside, and it’s giving K and I a solid opportunity to strip everything away from what was and do this workshop right. Working together, we can start at the fundamentals of what would make this a dream space. Then, we’ll add a couple new, flip-top work benches that we can snap to the walls and move around (and take with us someday if we move). Prepare yourselves for the worst picture of the post (c’mon, I know you just love seeing messy photos!). The garage has spiraled into chaos for the umpteenth time. Thanks to the Purple team, I received a full pallet to make sure I had enough to cover my entire garage. Each panel is only 5/16″ thick, so this stack gives us enough to cover both the drywall and my office. We started installing just last weekend, so it was a great opportunity for me to teach K about installation and refresh my own skills. 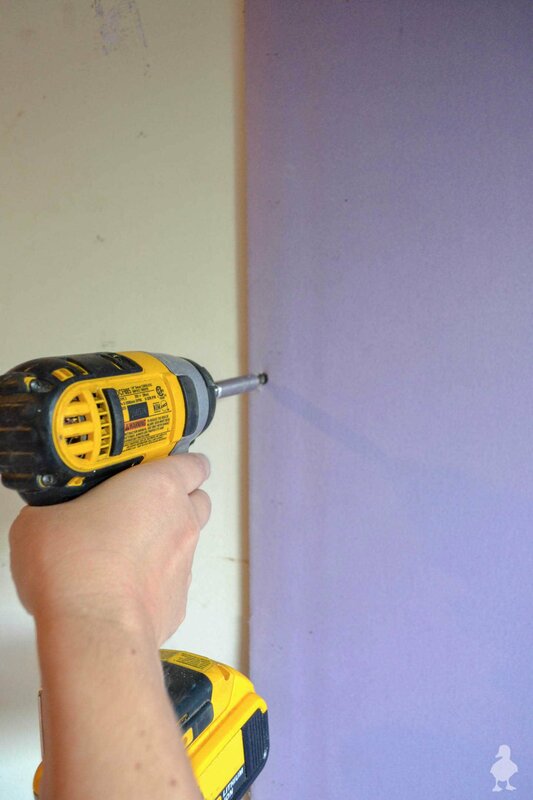 I’ve installed drywall over wood paneling once before at my parents’ house, but never done it over existing drywall. So, I’ve got some new tips to share! Painter’s tape works excellent for this. 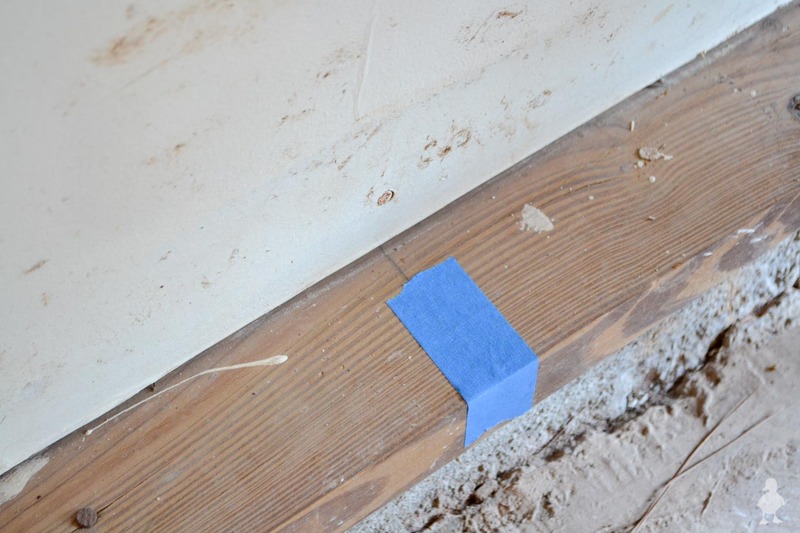 Measure the wall and subtract 1/4″ at the top and bottom. Since my wall wasn’t square, we used some cardboard to act as wedges along the bottom so we could keep things as straight as possible. It’s pretty normal to not get things right the first time (even if you think you know what you’re doing), so don’t feel discouraged if the fit takes a few tries. Measure twice (or eight times), cut once. Using a utility knife and a straight edge (we used some scrap wood), run the blade all the way down/across to create your cut. Take your time on this. Straying away from the line, even if you correct it with a second scoring, risks the snap going awry (it might break along either line unless you score the correct one super deep). Score the other side as well (for us in this space, it was a bit difficult since we didn’t have room to flip over much, but we were just more careful). Then, move the piece out far enough to allow gravity to do some of the work, and snap the edge. It may take a few more cuts through the paper to get it to break away completely, but it doesn’t take long to get the hang of it. I had a tube of caulk/adhesive and ran a bead up both edges and the middle, then flattened the bead out. 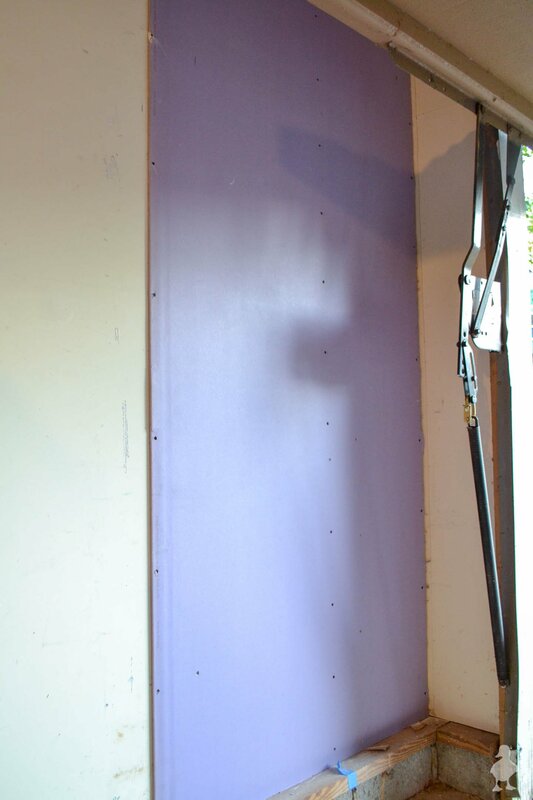 This helps the thin board stick to the existing drywall and holds it into place while screwing it all in. 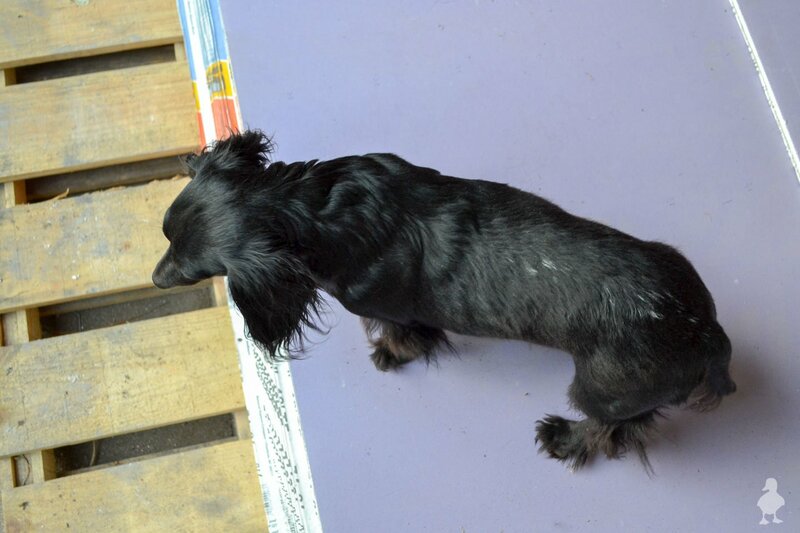 Stella was basically our mascot through the entire learning curve. She’s normally busy hunting in the neighbor’s ivy when we’re in the garage or in the front yard. But this time, she just wanted to hang out with us and observe. 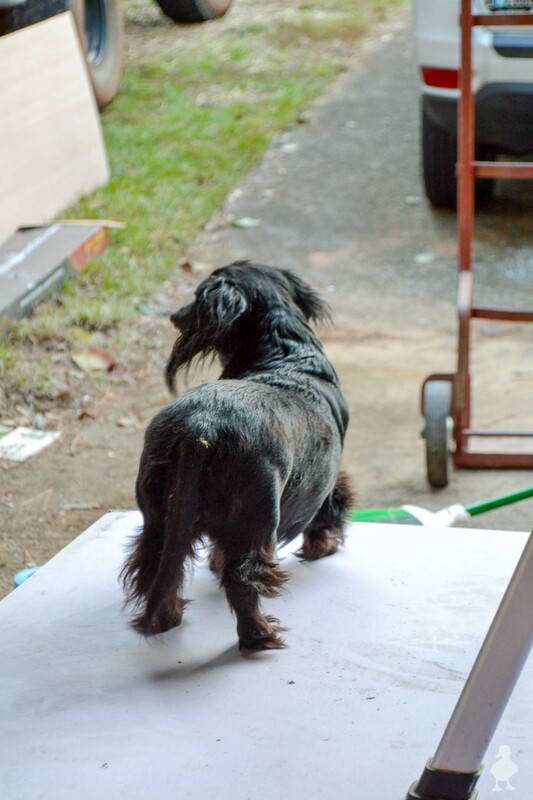 She really liked the stack of drywall; it seemed the perfect height for her to look out and see what Charlie was doing in the yard! Per the installation instructions, we screwed the panel in with 1 1/2″ drywall screws. 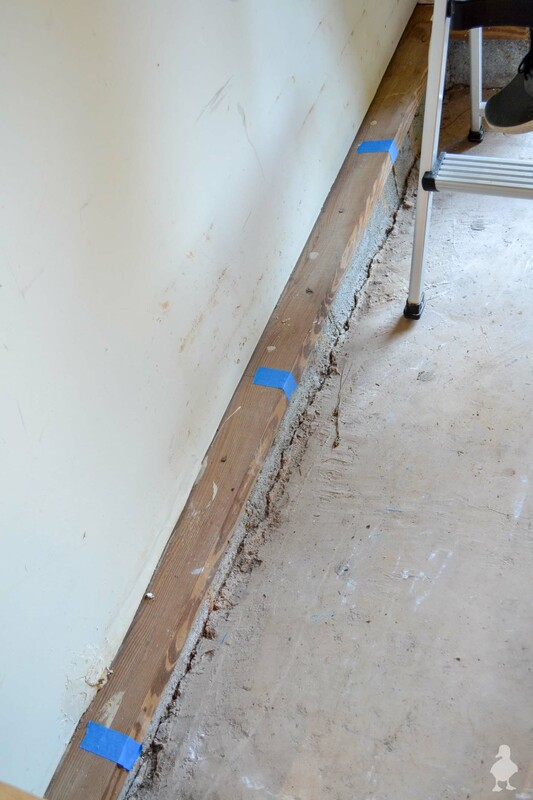 Both sides of the drywall panel are tapered so that they have room for tape and mud. 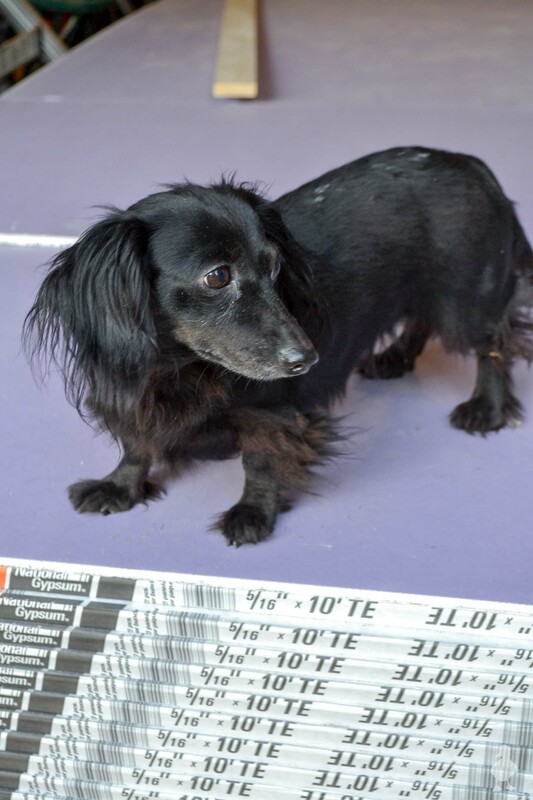 One of the things I took note of was the balance of getting as close to the edge of the drywall as possible without snapping off the edge (it will break the drywall edge if you get too close). Again, it just takes a little practice. We actually had to install the first piece twice because we realized that it only matched up to the studs if we cut a few inches off (vertically) on the right side. 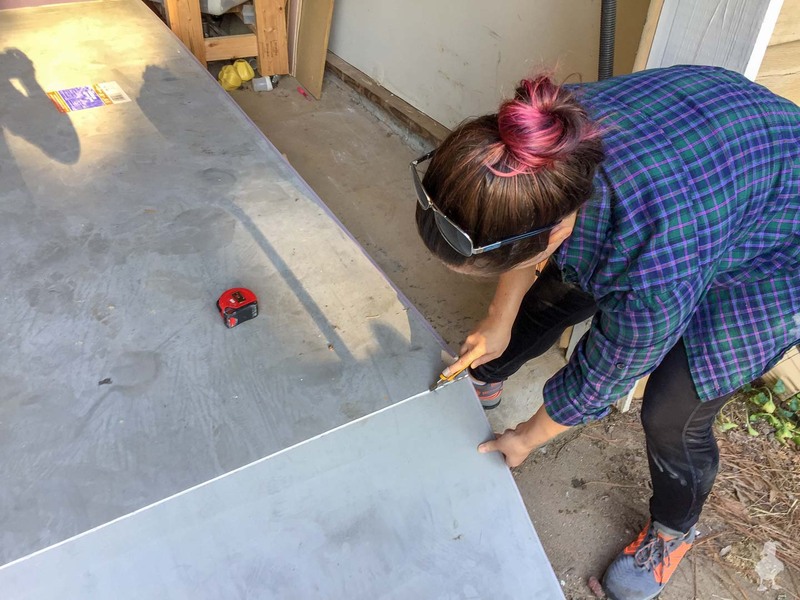 Even though it was a pain to correct our first mistake assumption that we could install a whole piece right away, taking it down and cutting off those few inches made sure that the left side of the first piece would half-overlap on a stud and leave room for the next piece. This would then create a vertical seam with all of the screws sunk in well. This is important, because your screws will simply spin if they can’t grip onto anything solid behind the drywall. You want the head of the screw to sink into the drywall and to “dimple” a little. Later, you can cover over it with tape & mud and not see seams. If the screws don’t sink well, they’ll stick out very obviously when you try to patch seams and cover up screw holes. This panel was also made difficult by the fact that it was right next to the garage door. My one-car garage is very long, but it’s crazy narrow, so working the two of us plus one large piece of drywall wasn’t the easiest task. Still, I think we picked up some valuable lessons on installing the next few pieces, and it will go a lot faster from here on out. We’ll be simultaneously organizing and installing as we go! After taping and covering up the seams, I’ll pick out some new paint, possibly add a custom workshop sign (giant wooden duckling art, anyone?? ), and more. Per usual, K wants a TV mounted somewhere in here, but he hasn’t convinced me yet. Obviously, this is one of those “it’s going to feel like a huge task until it’s suddenly done” kind of things. Or maybe even a “if I build it right, this space will simply explode with cool ideas” kind of things. Either way, I am really excited about it, and genuinely appreciative of how awesome the Purple team has been for providing the tools to get this job done. Stay tuned! You’ve got a little helper! So cute!